Come with AVID......back to a time when the Keyboard was King (and King was a lanky one hit wonder and not a "cool " MTV jock!) Actually we blame those pesky krauts Kraftwerk and that barmy Bowie for all those bad haircuts and silly synths. 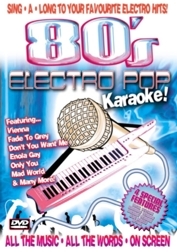 But hey, they did make some pretty good pop music despite the haircuts and they are all here for you to sing a long to on AVID's latest karaoke release 80's Electro Karaoke. We think we have covered most bases from the original bad haircut boy Phil Oakey's Human League to gloomy Depeche Mode and OMD to the other even worse haircut boy in A Flock Of Seagulls to our original sinners of the synth Kraftwerk.